French books, bookends and picture frames add the finishing touch. Memorable moments : framed. Picture frames with the amazing cuts of Eye Collection : horizontal cuts on the front, vertical at the back creating dazzling effects. Intricate front horizontal cuts and back vertical cuts create a dazzling effect. From the Eye Collection, designed by Nicolas Triboulot. Crafted of crystal. 7.25"W x 9.25"W; holds 5" x 7" photo. Crystal frame. Horizontal cuts on one side and vertical cuts on the other for an extraordinary visual effect. Established in 1830, Christofle created silverware for French royalty, including King Louis-Phillipe and Emperor Napoleon III. Each piece is proportionally balanced and hand finished for unsurpassed beauty—and designed for everyday use. 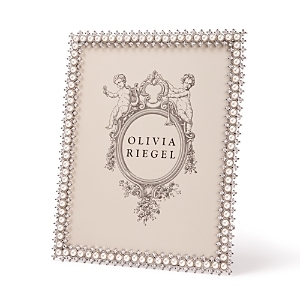 Christofle Egea Frame, 7" x 9"
Silver-plated photo frame. Honeycomb texturing. Tarnish-prevention coating. Holds a 4" x 6" photo. Made in France. Silver-plated frame. Wood back. Made in France. Silver-plated frame. Wood back. Holds 5" x 7" photo. Made in France. 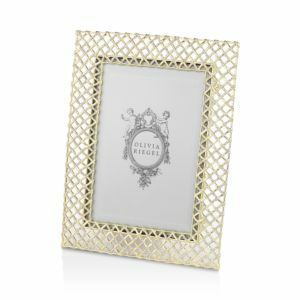 Christofle Malmaison Frame, 4" x 6"
Silver-plated metal frame. Holds 4" x 6" photo. Made in France. 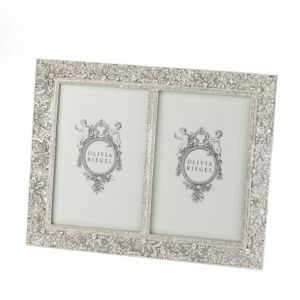 Silver-plated picture frame. Displays vertically or horizontally. Black easel back. Silver-plated frame. Wood back. Holds 5" x 7" photo. Made in France. 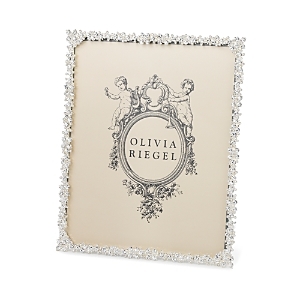 Highlighted by shimmering Swarovski crystals, this frame collection brings an elegant touch to your favorite memories This meticulously detailed frame is accented with dozens of hand-set Swarovski® crystals and beads. 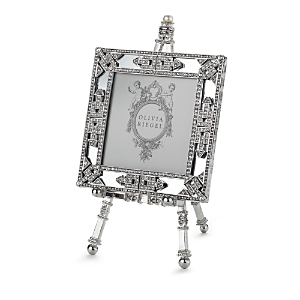 Pewter/Swarovski crystals/glass/silk Display your favorite memories in lustrous style with this elegant silk back easel frame, highlighted by a glittering array of hand-set Swarovski crystals. Cast pewter frame with a silver finish. Hand-set European crystal accents. Can be placed vertically or horizontally. Pewter/European crystals Cast pewter frame with a silver finish. Hand-set European crystal accents. Can be placed vertically or horizontally. 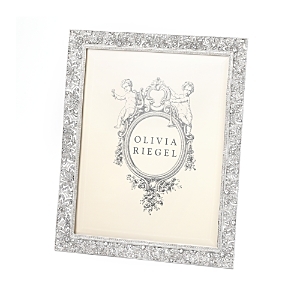 Pewter/European crystals Display your favorite memories in lustrous style with this elegant silk back easel frame, highlighted by glittering starburst motifs dotted with hand-set Swarovski crystals. 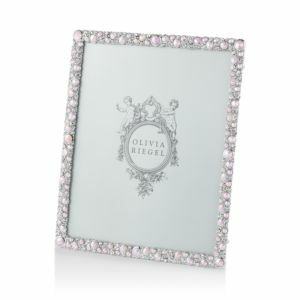 Stunning clusters of Swarovski® crystals adorn this brilliant frame that's fit for a princess. 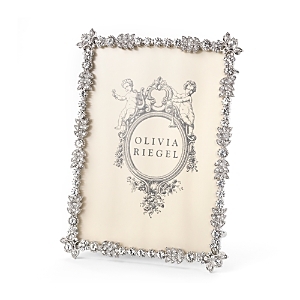 Pewter/Swarovski® crystals Crystal & Pearl Frames by Olivia Riegel. 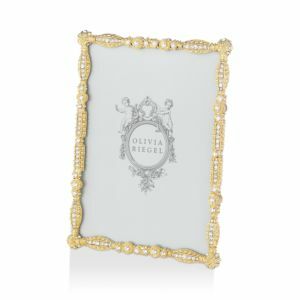 Delicate frame with faux pearls and Swarovski crystals in a silver-tone metal finish. Ornate latticework frame. Hand-set Austrian crystal accents. Moiré silk easel back. 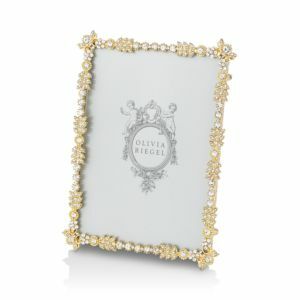 Displays vertically or horizontally on tabletop Mirrored glass frame with gold-tone metal blossom motif. Hand-set European crystals. Moiré silk easel back. 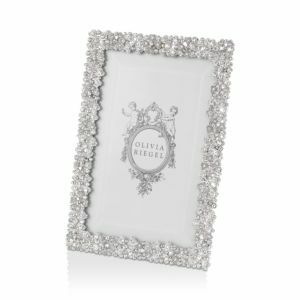 Displays vertically or horizontally on tabletop Hand-set Swarovski® crystals add regal opulence to these brilliant frames from Olivia Riegel. 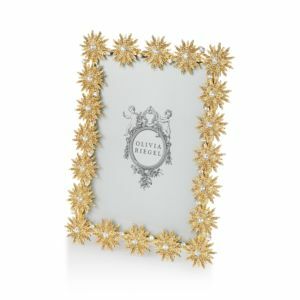 L'Objet Stars Gold Frame, 5" x 7"
Stars Gold Frame, 4" x 6" Stars Platinum Frame, 4" x 6"
Stars Platinum Frame, 8" x 10" L'Objet Decorative Noir Frame with Crystals, 5" x 7"
L'Objet Decorative Noir Frame with Crystals, 4" x 6"
24-karat gold plated frame. White Swarovski® crystal trim. Beveled glass. Satin lining. Leather back. Platinum plated frame. White Swarovski® crystal trim. Beveled glass. Satin lining. Leather back. Platinum plated frame. White Swarovski® crystals. Beveled glass. Satin lining. Leather back. 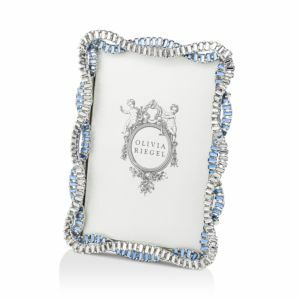 L'Objet Braid Platinum Frame, 8" x 10"
L'Objet Platinum Braid 4" x 6" Frame L'Objet Garland Swarovski® Crystal Frame, 8x10"
Handcrafted frame. Platinum-plated metal. Braid motif. Beveled glass front. Leather backing. Frame by L'Objet. Platinum-plated. Pavé white Swarovski® crystals. Beveled glass. Satin lining; leather back. Holds an 8" x 10" photo. Gold-plated metal. Braid motif. Beveled glass front. Stretch leather backing. Handcrafted. Handcrafted frame for a 4" x 6" photo. 24-kt. gold plate and beveled glass. Satin lining; suede back. Emulating centuries of fine jewelry design and technique, these meticulously handcrafted frames are outlined by an abundance of petite flowers with sparkling crystal centers. L'Objet Deco Twist 24k Gold Frame, 8" x 10" L'Objet Scales Platinum Frame, 5" x 7" L'Objet Pave Black Frame, 8" x 10"
L'Objet Pave Black Frame, 5" x 7"
Pave Black Frame, 4" x 6"
L'Objet Rectangle Pave Frame, 2" x 3"
L'Objet 24-karat gold-plated frame. Holds an 8" x 10" photo. Beveled glass. Satin lining. Leather back. Emulating centuries of fine jewelry design and technique, every L'Objet frame is meticulously handcrafted with details as Swarovski® crystals, 24-karat gold or platinum plating, beveled glass, satin lining and Italian leather backs. Platinum plated frame. White Swarovski® crystals. Beveled glass. Satin lining. Leather back. Picture frames add a personal touch that enhances your favorite images and keepsakes from French Country charm to high tech digital. Jay Strongwater Floral Branch Frame, 8" x 10" Jay Strongwater Floral Cluster Frame, 5" x 7" Jay Strongwater Floral Branch Frame, 4" x 6"
Handcrafted, hand-polished 18-karat gold plated frame. From the Composition Collection. Finished with a mahogany backplate and kickstand. Handcrafted, hand-polished 18-karat gold plated frame. From the Composition Collection. Finished with a mahogany backplate and kickstand. 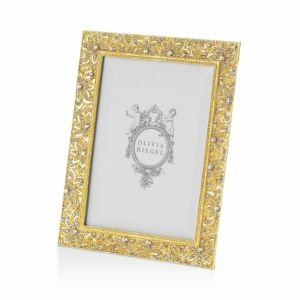 Overall, 8"W x 10.3"T. Handcrafted, hand-polished 18-karat gold plated frame. From the Composition Collection. Finished with a mahogany backplate and kickstand. Handcrafted frame. Cast metal. Hand enameled and hand set with Swarovski® crystals. May be displayed vertically or horizontally. Bookcase made of Chilean pine and Peruvian oak. Three shelves; one drawer. Handcrafted bookcase. Golden highlighted accents on moldings and carved details. Hardwood frame.